As someone who has to train first thing in the morning, it can be hard to get my energy levels right. I can’t eat before training, as since I work late in the evenings, there is no way I’d be able to get up early enough to eat and digest something beforehand. Getting up for training alone is enough of a challenge in itself, sometimes! However, training on an empty stomach can sometimes leave me feeling drained. In turn, I also feel a massive energy slump later in the day. The post-training crash is something I’ve battled with for a long time. Immediately after training I would feel great, but no sooner would I emerge from the shower than I would feel the urge to lie down, usually succumbing to an accidental nap. If there was something that I needed to do after training, I would put it off for as long as possible, because I could never manage to find the energy to get myself going again. While I love nothing more than a nap, it’s not very practical, especially if you have a busy schedule. Apparently, it is ideal to replenish energy stores that are depleted in training by eating something rich in protein and carbohydrates around 15-30 minutes after finishing a work-out. However, this is easier said than done, as it can be really difficult to find something that’s quick and easy but also contains the correct nutrients. If I leave it too late after training to eat, I’m much more likely to grab something that’s total trash and fall off the wagon. Equally, it’s difficult to know what to eat before training. I want something that won’t leave me feeling full or bloated, but will sustain me with slow-releasing energy throughout the session. It’s hard to find that balance, but after a long period of trial and error, I eventually worked out the ultimate pre/post-training snack. I’m certainly not an expert, but I know what works for me, and this is it. I feel sustained for longer in training: As well as having more energy in my training sessions, I’m also able to train for longer when I eat just one of these beforehand. After the group session is done I regularly stay for an hour or two to do extra training without feeling drained. No more post-training crash: I no longer feel the need to take a nap straight after training, so I’m more alert and productive throughout the day. Nutrition: They’re high in protein, unsaturated fat, fibre and various other beneficial delights. Convenience and all-round awesomeness: As well as being the perfect thing to grab before or after training, they also make for a great snack for any time of day, and stop me from reaching for something less nutritious. Plus, they taste awesome. Now, here’s how to make them. This recipe makes approximately 14 balls. You can substitute a lot of these ingredients for other things. For example, I prefer to use almond butter and sometimes sunflower paste, but peanut butter is equally delightful. I love chia seeds because they’re packed with amino acids, protein, vitamins and anti-oxidants, but sunflower, sesame, pumpkin or flaxseed also work well. You could also put some shredded coconut in there, or even some spirulina, if you’re feeling a bit crazy. You get the idea. Once you’ve decided what ingredients to use, here’s what you’ll need to do with them. 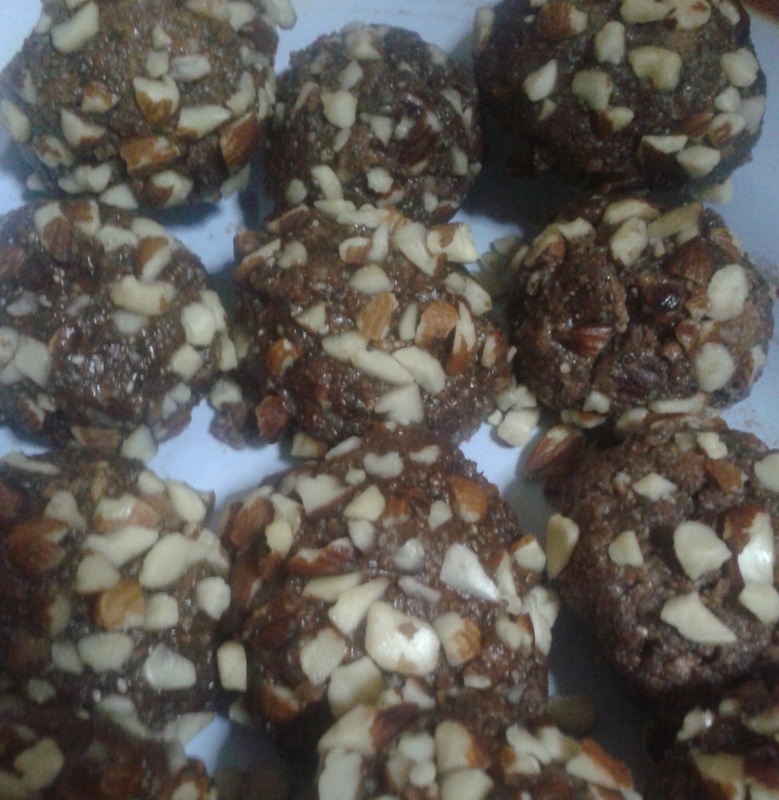 (The ones topped with cashews were left over from the previous batch). That’s it! I make these once a week and keep them in the fridge, ready to grab before and after training. 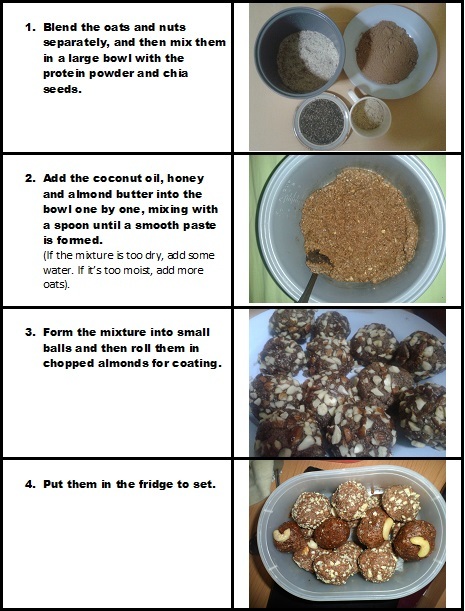 You could also play around with this recipe and use it to make protein bars, if balls aren’t your thing. Either way, enjoy! Where are you finding flax seeds and chia seeds? I know Bangkok has a greater variety of such things than elsewhere, but are you just using a TOPS market or do you have some kind of fancy local specialty store? I wish I could say that I found them at a Tops market. It took me a while, but I eventually found a little niche health food place with lots of awesome stuff. There are Thai companies from which you can buy that stuff online, but I’ve never used them. In the UK (and I am sure other countries too) you can buy dried/canned food goods on Amazon which is convenient! You can also ‘subscribe’ to the items and get a packet every month for a slight reduction in price. Thanks for the post! I’ll give it a try. A food I’ve been using for similar purposes is pumpkin with eggs, the third dish in this video (as the guy in the video says, it does taste better than it sounds). The guy does it with savory spices, but you can also do a custard-like dish with spices that work better with sweet foods (e.g., cinnamon) & sugar or honey or whatever you like. Also, spoonfuls of raw shelled hemp seeds right out of the bag as a quick hunger-pang stopper. Thanks for your comment. I actually discovered pumpkin and eggs in Thailand and it’s one of my favourite things! I love it. I try to eat it as much as possible. Argh, I really want some now..
Those look really good. I hate all the crap they put in protein powder, though. Always seems like it’s a big list of chemicals. I’m assuming you use chocolate-flavored powder for these? Yeah, I know what you mean. I was so anti-supplements for the longest time, it’s only just recently that I’ve started using protein powder, because I seem to find it hard to get the right things into my diet in Thailand. I use chocolate flavour, but any kind will do! I actually got inspired to make these after reading and substituted when what I had in the house wasn’t exactly like the recipe. One of the things I used was hemp protein powder. It’s great, especially because hemp isn’t water-soluble so it kinda would fail in smoothies and stuff in the past so this is a perfect way to get around that. Also, they are a dark vibrant green! Hemp protein powder is a bit of a weird specialty item though. Don’t know about its availability in Thailand or anywhere outside the US. Awesome, hope they turned out well! I’ve been experimenting with a lot of different recipes, too.